If you're looking for a spot to relax and really take in a sample of what Central America has to offer, you can't go wrong with Belize. One of the most unique countries in the region, Belize offers a number of incredible locations that are perfect for vacations or longer stays. The Ambergris Caye amenities alone are spectacular and more than enough to keep you busy for as long as you would care to partake in them. The fact of the matter is, whatever you're planning, there is something in Belize to help you make it a reality. Extensive opportunities abound on Ambergris Caye to explore beautiful settings both in and out of the water or just relax and enjoy the white sand beaches. One of the most incredible natural barrier reefs is less than a mile offshore from Belize. The reef is one of the many astounding natural amenities around Ambergris Caye to explore. Another popular activity is scuba diving in Shark Ray Alley. The country's commitment to environmental preservation means that you can enjoy abundant responsible deep sea fishing or sailing in some of the bluest water in the Western hemisphere. There are also plenty of amenities to take advantage of on land including walking tours of the abundant natural resources, explorations of nearby ancient ruins and great night life. You can also immerse yourself in the local culture, one of the most unique in Central America. Maybe adventure isn't what you're looking for, and you'd rather spend your golden years in a more relaxed lifestyle. 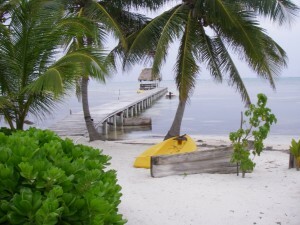 Belize is a fantastic place to consider for retirement. The communities are built among the most treasured amenities on Ambergris Caye. Many are close-knit groups of people who have formed lasting friendships. There are a number of outdoor activities from swimming and hiking to golf and tennis to take advantage of. Due to the Caribbean breezes, the temperature stays fairly consistent in the 70s and 80s. Whether you're looking to ramp up the excitement in your life or trying to let go of all that stress, spending time in Belize will help. With its beautiful, white sand beaches, tropical scenery and abundant activities, there is something for everyone.